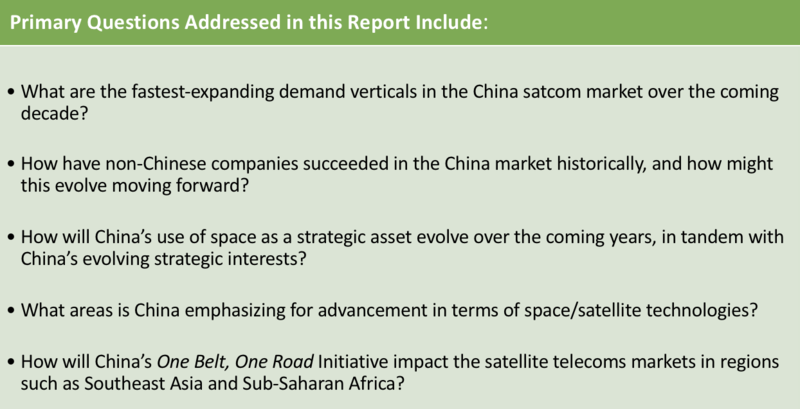 China now plays an increasingly significant role in the space and satellite telecom industry. While still playing catch-up to the United States and Europe in areas of launch reusability, HTS, flexible payloads, the Chinese export machine has started to target higher-value industries, and space/satellite is included among them. This leads to an increasing number of satellites exported from China to regions across Eurasia and Africa, with all this occurring while the Chinese domestic market is ramping up HTS, and with it, future growth prospects. Drawing from NSR’s extensive databases and over 17+ years of satellite industry data, China Satellite Markets quantifies the dramatic changes taking place in the China satellite industry both now and over the next decade. 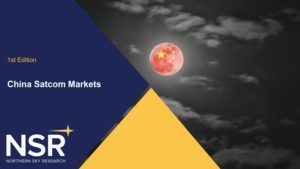 With data from NSR’s library of reports, combined with the company’s signature holistic analysis, China Satellite Markets is the go-to tool for in-depth analysis of the Chinese satellite market, with sufficiently granular data points allowing for detailed understanding of specific markets and trends. 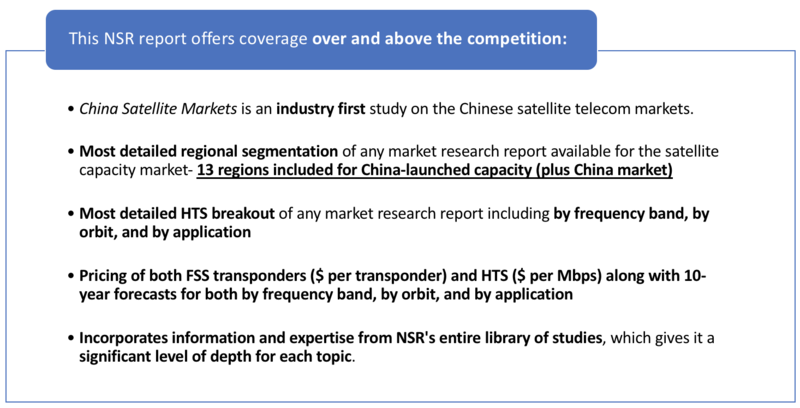 NSR’s China Satellite Markets combines several component sections to provide the reader with a 360-degree view of the opportunities and challenges arising from the rise of China as a space and satellite telecommunications player. 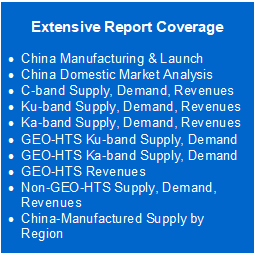 The domestic market analysis includes demand verticals such as video distribution, commercial mobility, and enterprise data, across C-band, Ku-band, Ka-band, GEO-HTS Ku-band/Ka-band, and Non-GEO-HTS. The section also includes supply forecasts for the China domestic market, with discussion on supply assumptions. Beyond this, the report includes a chapter on Chinese-manufactured capacity and its impact abroad. China Satellite Markets combines NSR’s signature quantitative forecasting—in this case Chinese-manufactured capacity by frequency band across 13 regions—with in-depth analysis on Chinese companies that may launch capacity abroad, as well as the impact of national satellite programs financed by China but launched by countries in the developing world.